Centuries ago, in the upper Midwest, there existed a loose confederation of Native American tribes that included, among others, the Cahokia, Tamaroa, Kaskaskia, Michigamea, and Peoria. In the Algonquin language that many of these tribes shared, the native inhabitants of the region were collectively known as “ih-LYNN-o-ah.” Together with some effort, these tribes were able to coexist and share the land to construct an amazing cooperative society. Today, locations such as Cahokia Mounds and Starved Rock still offer insights for those interested in learning about various early Native cultures in the region. Over time, French settlers in the region evolved the pronunciation of the state to its present form. The in 1818 Illinois became the name of our nation’s 21st state. The University of Illinois was established in the year 1867. Soon after, it began fielding athletic teams named the “Fighting Illini.” This nickname came from the soldiers for whom Memorial Stadium is named. The soldiers understood the importance of comradery in the face of adversity, and so they chose to name themselves after the Native peoples that established the history of their home state. The University was as proud then, as it is now, to be associated with the Native peoples for whom the state was named. The Illini attributes of strength, courage, and honor were deeply admired and well-respected. In 1926, two Eagle Scouts, Lester Leutwiler and Ralph Hubbard, combined their extensive knowledge of Indian lore and dance that they learned at the World Boyscout Jamboree in Denmark into the creation of “the Chief”. The intention of the symbol was to reflect the honor and tradition at the University of Illinois. The Chief was not created to portray a real person, rather, a high-minded concept of unity. The Chief’s regalia has a deep symbolism as well, representing the accomplishments of the University as well as unity amongst conflict. The Chief itself was imagined as a fictitious leader for all of the Illini tribes, uniting students of different cultures and backgrounds much in the way that the Native tribes had united to share the land before the University’s existence. The Chief maintains this sense of unity by allowing students of any race or gender to represent the role. Over the years, the Chief has served as a symbol of belonging and pride for hundreds of thousands of men and women, all proud to call themselves “Illini,” and prouder still to honor the tradition for which the Chief stands. The Chief serves as a symbol, rather than a mascot, by refraining from silly antics during the game and only performing a set routine that has been approved by the Council of Chiefs. The Chief embodies the attributes we value as alumni, students, and friends of the University of Illinois at Urbana-Champaign. The tradition of the Chief is a link to our great past, a tangible symbol of an intangible spirit, filled with qualities to which a person of any background can aspire: goodness, strength, bravery, truthfulness, courage, and dignity. It can be said that the Chief is a reflection of what you see in yourself and your community. If you see honor, respect, and tradition, that's what you provide to the world around you. That being said, the reflection also holds true to yourself if you only see hate and divisiveness. The original dance performed by Lester Leutwiler was inspired by authentic dance moves learned from his time in Boy Scouts. A common practice in Native art is to never exactly replicate the creation of another artist, and so each Chief makes their own small edit to the dance. As a result, the current dance is vastly different from the original. The Chief dance is representative of a “fancy dance,” which is performed to capture attention and provide entertainment. The dance is an important part of the Chief tradition that is still passed down within the Council of Chiefs. In 2007 the NCAA ruled that schools with Native imagery must get permission from the tribe they were representing or they would be forbidden from hosting post-season tournaments. Schools such as Florida State and Utah were able to partner with local tribes and maintain their imagery. Schools like Hawaii and San Diego State were also able to retain their Native imagery as they did not represent federally recognized indigenous tribes. Illinois was a difficult case because the Chief represented a confederacy of several tribes, rather than just one. Nevertheless, the NCAA decided that the Peoria Tribe of Indians of Oklahoma were responsible for the Chief’s fate. The Peoria ultimately voted against supporting the Chief and the symbol was retired from the University on the grounds that it was “hostile and abusive.” Despite the retirement, the University continues to hold its trademark on the logo and make money from its merchandising. In 2013, the Peoria were in talks with the Council of Chiefs, raising the possibility of re-voting, provided the University would partner with the tribe. It was now the University’s turn to decide on the fate of the Chief, but UIUC Chancellor Phyllis Wise refused to re-open a dialogue. In 2017, UIUC Chancellor Robert Jones announced that the Marching Illini would be banned from playing the “War Chant.” This was viewed as a victory from anti-Chief activists, who have made it their mission to ban from campus any music and imagery that could be associated with the Chief. The image was created in 1980 by local artist Jack Davis, also a current member of HTCS. The Davis Symbol is an important representation of the Chief’s presence as a symbolic icon rather than a mascot. The Davis Symbol serves as an incomparable image of honor and dignity, helping to secure the Chief as a noble example of how Native American imagery can be enjoyed and appreciated with respect in our modern society. Regardless of its place in the Chief tradition, the image of the Davis Symbol stands in a league of its own due to the thought, care, and passion that went into creating a brilliant piece of artwork. It is important to note, that the ownership of The Davis Symbol still resides with the University, who even today produces and profits from merchandise bearing this image. After the retirement of the logo in 2007, the University ignored the requests of original artist Jack Davis to have the image returned to his control. Beginning in 1991, the Honor The Chief Society strives to represent and preserve all of those positive facets of our community which the Chief so perfectly embodied. However, after the Chief’s retirement, it can be difficult to fully appreciate the Chief tradition without its traditional symbolism. The HTCS logo shares elements of Native American design, without using the image of a Chief or other human symbolism. The logo captures the ability to be influenced by Native American style and move forward while acknowledging the past. The circular appearance of this logo shows the unending influence of the Chief, as well as the Native peoples of this state. The echoes of our past will forever sound in the efforts of our futures, and the sound of our history will never be forgotten as long as a single heart continues to beat to its rhythm. The “Paint-In-Motion” imagery was commissioned by the Council of Chiefs in 2011; created by Kurt Wisthuff. 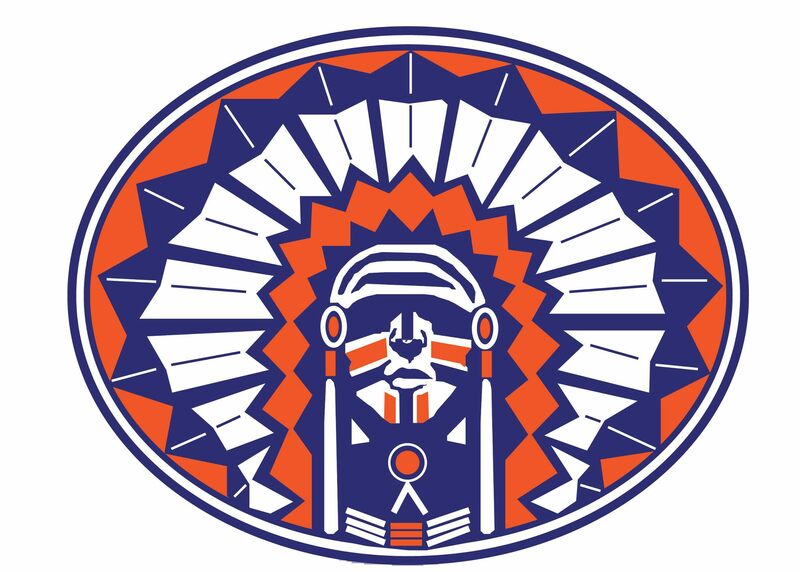 The symbol is used as the primary logo by the Council, as well as the campus RSO Students for Chief Illiniwek. The face-paint is one of the last aspects of the Chief regalia to be donned by Chief portrayers. Though the individuals behind the Chief tradition embody positive values in their own right behind the paint, with the regalia on they become part of a tradition that is greater than themselves…no longer representing their individuality, but the collective spirit of an entire University community. The tradition of wearing face-paint has its roots in Native American culture, where individuals would paint their face for any number of intentions from intimidation to protection. For the Chief, this “war paint” also represents safety & protection…a symbolic shield painted in the school colors to keep the campus environment safe amongst conflict. The “Paint-In-Motion” logo signifies this deep meaning, while also showing the capacity of the Chief tradition to be ever-evolving rather than a static image. The “Continuing Tradition” image, also known as “The Oval Chief” was created in 2011 by local artist Ivan N. Dozier. 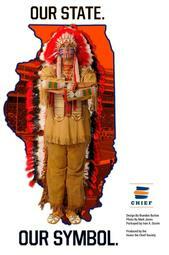 Ivan created the image using a photo of his son, Ivan “Alex” Dozier dressed in the Chief regalia. This logo is special in a number of ways. “Continuing Tradition” portrays an actual Native American student and was drawn his father, both of whom were born and raised in Illinois. In this way, the image helps to highlight the modern contributions of Native peoples in Illinois. “Continuing Tradition” also has a double meaning. Not only did Alex Dozier continue his family tradition of attending Illinois but he also donned the regalia himself. This image recognizes that personal accomplishment, as well as the importance of recognizing leadership and tradition in our modern society. The Continuing Tradition image is not sponsored, licensed, approved, or endorsed by the University of Illinois and is the property of the original creators.